Galette from the Norman word gale meaning flat cake is a term used in French cuisine to designate various types of flat round or freeform crusty cakes, or, in the case of a Breton galette (French: Galette bretonne, Breton: Krampouezhenn gwinizh du), a pancake made with buckwheat flour usually with a savoury filling. Of the cake type of galette, one notable variety is the galette des Rois (King cake) eaten on the day of Epiphany. In French Canada the term galette is usually applied to pastries best described as large cookies. 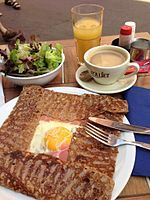 Galette, which is more properly called Breton galette, is also the name given in most French crêperies to savoury buckwheat flour pancakes, while those made from wheat flour, much smaller in size and mostly served with a sweet filling, are branded crêpes. This type of galette is a large, thin pancake mostly associated with the region of Brittany, where it replaced at times bread as basic food, but it is eaten countrywide. Buckwheat was introduced as a crop suitable to impoverished soils and buckwheat pancakes were known in other regions where this crop was cultivated, such as Limousin or Auvergne. It is frequently garnished with egg, meat, fish, cheese, cut vegetables, apple slices, berries, or similar ingredients. One of the most popular varieties is a galette covered with grated Emmental cheese, a slice of ham, and an egg cooked on the galette. In France this is known as a galette complète (a complete galette). Another variety is a hot sausage wrapped in a galette (called galette saucisse, a tradition of Rennes, Brittany) and eaten like a hot dog. ^ David Lebovitz, "Free-form Rustic Tarts: Whether Sweet or Savory, a Galette is Less Fussy than a Traditional Tart and Offers more Crisp Crust", Fine Cooking, no. 40, archived from the original on 12 August 2014, retrieved 26 December 2014 . ^ Anne Willan (2007), The Country Cooking of France, San Francisco, Calif.: Chronicle Books, p. 236, ISBN 978-0-8118-4646-2, GALETTES BRETONNES AU SARRASIN. BRETON BUCKWHEAT GALETTES. The filling for a paper-thin Breton galette is always simple. The most popular, called a complet, includes ham and egg and often a spoonful of fresh cheese. You can ask for the egg to be brouillé, briskly scrambled on the hot galette, or miroir, left untouched to bake on top. When the galette is pleated, the golden egg yolk peeps out of the crisp brown folds. This Brittany-related article is a stub. You can help Wikipedia by expanding it. This article about French cuisine is a stub. You can help Wikipedia by expanding it. This page was last edited on 3 April 2019, at 06:57 (UTC).